Ordered Troy-bilt mower with the Lowes app on my phone this afternoon (09/22). Great! Free shipping and total is less than $650. 09/22 3:07pm Got email confirming Ordeer #356606090 and delivery tomorrow morning between 10am and noon. Wow! 09/22 3:14pm Got email from credit card to confirm charge by Lowes. 09/22 3:46pm Got call from gal at Lowes Victorville informing me they don't deliver more than 20 miles to Cherry Valley and she was cancelling my order. I ordered she DO NOT and that my credit card was already charged. I have included the order status (cancelled by them) and my CapitalOne charges. Your phone app is dysfunctionate junk and nowhere is there a 20 mile free delivery limit disclaimer. This is fraud! I avoid Lowe’s if at all possible but I need paint. I have to come here and as usual they are earning their name of Slowes. I have now stood in a line five deep at the paint counter for 15 minutes and they have yet to process one customer completely. They have one guy that is trying to keep up and can’t. Luckily the service desk is right across the isle ignoring it all. This store is simply horrible at service and it’s acros the board. The checkout is worse than all of them. The fundamental problem is it is not staffed properly. Once again I try to stay away from this store and The is why. I bought Samsung Refreigerator on 7/5/2018 using online Lowe’s and was delivered by Sunnyvale store. The refrigerator is lemon and started leaking from day 1. Samsung subcontracted. two companies tech.s and after 10 visits with no fix in sight, Samsung issued Ticket Number 4148304152 and contacted Lowe’s at Sunnyvale, CA to ship me a new one. Due to poor management on both sides , no delivery has not yet occurred. I need God intervention to solve this. I was issued a credit on 8/18/2018 for $223.10 for a returned pedestal. As of today 9/7/2018 I have not received the credit on my credit card. I keep getting the run around when I call the store and corporate customer service. The return order number is 354335699. It took 3 months to get the washer we purchased now I have to deal with this too. I purchased my Z 254 Zero Turn Mower / 967324101-00 from Lowes in Killeen Tx in March 2016. When the mower was delivered, I drove it around to the front yard and the mower belts fell off. I contacted Lowes and they came out and took the mower back to the store and in a couple of weeks replaced it. It worked like a champ until the following spring. I would try to put take the brake off the left handle and the mower died. I finally got it to go forward and continued to cut. However, the problem returned after a couple of cuttings. I finally had a small engine repair man make a house call and he ended up taking the mower to his shop for repairs. He said the safety sensor had to be adjusted or replace. He was able to adjust it but had the same problem a month later. I regret to say that he has had to come to my house several times to preform repairs. I was so excited about getting the Z254 and when operational it cuts grass like a champ. I can not afford the repeated repairs on this mower. Since March 2016, I have had the mower in the repair shop 4/5 times. The mower shares my wife's car in my garage and I maintain recommended maintenance schedules. Are these repairs normal for your product or do I have a lemon? I would like to help lowe's to save a lot of money on the factory cat scurbbers, Triad service center is charging lowe's sometimes 500% on the parts and charging couple hours laber for maybe 30 minutes job. please have someone to look at this. I will be more than happy to help. I had a quart of paint mixed yesterday, there is a 'Sherwin Williams' section with paint chip cards to choose from. I was assured, more than once, that the paint color I wanted could be mixed. They put a tiny bit of paint on the top of the can to compare to, and I paid for the paint, as well as 'sealing wax' and 'antiquing wax' and went home to paint a very important piece of furniture. After the 1st coat, I had my doubts, but decided that it would probably dry 'darker', but that never happened, the paint had a purple tint to it. When I brought it back to the store, the clerk told me 'well, you can't have them mix a Sherwin Williams color and use Valspar paint, and Valspar color!!! I said, 'I didn't do anything, I'm the customer, they are the professionals, I don't know what you can or can't do with paint, that's why I came here, so that you could tell me'. I was so aggravated, because it seemed like she was blaming me for not knowing what Lowe's could or could not do. I called the store manager, 'Tina'. When I began to explain, she kept talking over me, saying she already knew what I was going to say, the clerk had already told her, I began again to explain, because I wanted to tell her what the clerk told me, instead, she interrupted me again, and I do not like to be interrupted, so I told her nevermind, since she wasn't willing to listen to me, I would just get online and file a complaint. An employee at the Sanford, Fla location named Vinny was very rude and smelled of alchohol. Very unprofessional behaviour. When purchasing a hot water heater, store personnel should advise buyer that unless the heater is installed by Lowes or their representative, the warranty is invalid. I was offered the extended warranty however upon opening the box, heater was dented and the container did not show any damage on the outside of box. Heater was still secured in the box. Upon returning the heater, I was advised that it was not warranty covered because I did not have Lowes install it. I think sales person should have advised me of the installation requirement. In late May when Lowes began selling Summer merchandise in its garden center, I purchased Two Patio Tomato plants at a cost of $15.98 each. They were the Bonnie kind which everyone else sells at that time of year. They were plants that are huge and guaranteed to produce huge tomatoes. In fact they claim that their plants will average a size of 10 to 14 inch tomato's.I n a period of three months, June, July, August, they produced about one tomato at a size of 2 inches in diameter. They state on the card that is attached to the plant that these are genuine "Heirloon " tomatoes in the beefsteak size. Needless to say, I took the plants back to the Lowes that I purchased them at. Watertown , N.Y. I showed the clerk in "Returns" the still affixed Lowes price and bar code still on the base of each plant. I asked if they could possibly refund me or give me a due bill. She told me absolutely not, and what is a due bill? When I stated that I could have bought 32 dollars of tomatoes at the Super market, she just laughed.. She was even getting a little nasty about it. I thought your employees are trained better than that. I went as far as telling her that I will never ever buy anything again at his store and will do all my shopping at Home Depot..And, I will pass the word along to all my friends. I remain an ex customer. Lowes of Jefferson city, Tn. installed a roof for me I had lots of issues but the biggest complaint is I ended up with 13 bundles of shingles left. applied for your credit card, they gave me a $3000 credit limit. i called to increase but was denied . never heard of the bank that issuing card. cancelled card. NEXT DAY APPLIED FOR AMERICAN EXPRESS LOWES CARD AND APPROVED IN 5 MINUTES FOR $10,600!! so what two bit bank do you do business with!! when i get the letter for denial i will give it to my attorney. More than likely there will be a lawsuit! I'm going to make this public so hard working people like me don't have to go through the aggravation. I would like your feed back. I spent one month trying to obtain a refrigerator from your company. 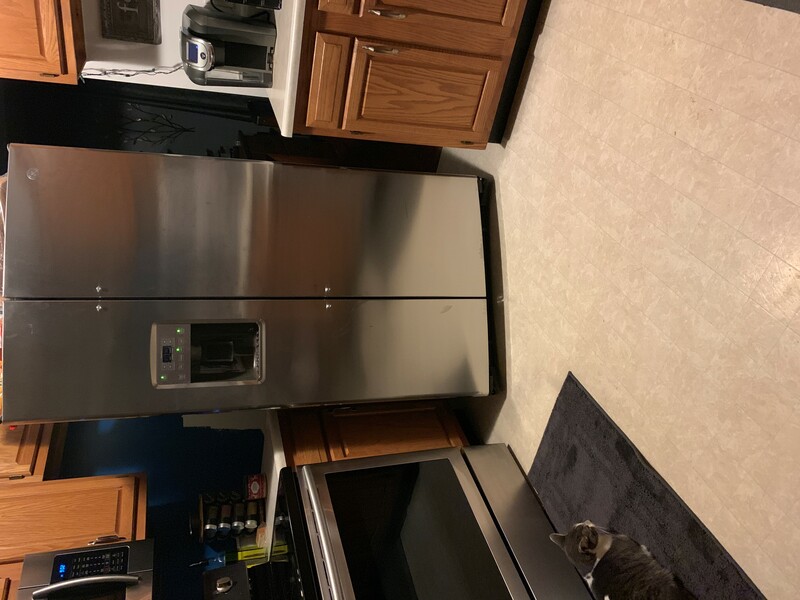 I purchased on-line on 7-10-18 and after no communication, physically went into the Warrington store and was told that since I needed a smaller (30 " wide) refrigerator the soonest I could have would be early August. The salesman seemed sincere so I figured I would wait it out. After two no shows on consecutive Fridays, I was finally assured it would arrive on Wednesday, August 1st. I had someone leave work early to be there between 2:30 and 4:30. Not only didn't they show, I was awoken early on my day off to be told my card would not go through (no previous balance on the card). Then STILL no one showed up! After being assured by Linda that my refrigerator would arrive on Saturday no one called from Lowe's to give me a time so I figured once more it was not coming. Then five minutes before I left the house I got a call they were coming! I was thrilled that my fridge was actually coming only to meet the the nastiest delivery man to ever come to my home. He obviously did not care to be of assistance and between his attitude and the stress I'd already been through, I told him to take the refrigerator and leave. I called another company the next day and had my refrigerator in thee days!!!! I realize that things don't always go as planned, but the constant miscommunication and numerous hang ups when I tried to call just were too much. I will definitely warn anyone using Lowe's to beware. I am in Sales and this kind of service is inexcusable. We ordered carpeting 6 weeks ago. Measuring was done 5 weeks ago. We have not heard anything since then When we call we get put on hold for an hour. We paid for this already. Will never shop at Lowe's again and will put complaints out on all social media, yelp etc. If there was a -5 rating, I would surely select it. This complaint is regarding Lowes in Rockledge Florida. It is now early August 2018 and no door. all agreed to take care of it..
the only person in that store that kept their word was Terry. She did follow up and finally got something started. -The person who took your order didn't put it in the right folder to be processed. Lowes has no record of the installer coming out. Corporate office contacted. Per Jeremy, he will have the store manager contact me directly..
"You need to calm down. We only got your request August 1. That's not our problem that you waited all of these months. Yes 6 weeks for a permit. You are in Georgia and this is Florida if you didn't know. " Contacted Corporate again- spoke to Crystal.. Who said she would have the store manager, David, contact me. I told her I do not want to talk to anyone from that store..
She said that was the chain of report and that she was sorry that it had not gone to him first. She could not give me contact information for corporate until I speak to him. Is it my fault that Jeremy did not find my complaint worthy enough to go to the store manager. " The ball was dropped in every aspect. It seems that each department is dependent upon the other. Well in this case, there was not department communication. This Chris person needs to NEVER HAVE INTERACTION with customer complaints. He is rude and speaks as if he is annoyed with speaking to customers who are not satisfied. He seems to have forgotten that he receives a paycheck because customers pay THEIR MONEY.. I wonder if he would be nicer if there were no customers for this store. I normally shop at the store in Titusville. I only came to that one because I was in the area visiting a friend. In other words, I will learn to stick with "my home Lowes". On 8/7/18, my friend and I walked into the Allen Park Lowes store #1859, we went to the Pro Desk station and talked to an employee I was asking his about the QSP quote I had with me and wanted to find out more information. He said he worked in the wood department and called a manager for me, which was fine. Today, 8-7-18 I went to lowes @ The Town Center, Naamans Rd, Wilmington, Del, 19810, to the paint department, and no one was there to wait on me.. I waited for 5 minutes and then left. This is not the first time this has happened at this store. The pluming dept. is the same. I have experienced this many times in the past. It is annoying and I hate to go to Lowes for this reason. I will put Home Depot down for my first stop hereafter. This store is notorious for this. I called before writing this, but I suspect the phone call I made will not mean anything. That is why I am taking the time to write this. My thoughts: Seems like when a store is succesful, then they get to the point when they take customers for granted. It took awhile, but it finally caught up with Sears . Are you on borrowed time also? I purchased stove, refrigerator, dishwasher and microwave. when the refrigerator was delivered they scratched my hardwood floors.. the delivery men didn't seem too concerned and he said he would take photos and tell his manager. I did not hear anything from a manager, so when the install department called to install the dishwasher and microwave I asked her about the floor damage and she said she would have a manager call me. The delivery was on 7-30-18 and I still haven't heard from anyone. I have emails and photos of my correspondence. An added note, when they deliveryman removed the old stove, i asked him if he should put something down on the floor to protect it and he stated he didn't have anything, so I gave him a towel... he also mentioned that floors get scratched all the time and that Lowes would fix it.... I find this statement very hard to believe. If you check my phone number I have used Lowes for many purchases in many different homes I own and I have never had this happen to me before. My dishwasher and microwave are to be installed tomorrow and I am very hesitant to have this done by your people. I would appreciate a call or response immediately. Ordered a door and transom on 3 jul to be installed in my home. I was told it would take 2 to 3 was to receive the items. Approx one week ago I received a telephone call telling me the items was in. I have made four trips to the store @ 4252 royal pine Dr. In Colorado Springs co.i have been given four different stories as to the location of the items. I have already paid for the items and still nodoor or transom. Today someone by the name of joe called me, after I again checked on the location of the items. Joe again could not tell me where the items are located. Joe was very rude and told me I could cancel the order. This is very unsatisfactory to the customer.again you have my money, I have no merchandise. Please investigate and advise. You have a bunch of idiots working your customer phone service for Lowes credit cards. A week ago I tried to place an online order for a box of engineered flooring. When I tried to use my Lowes credit card it kept showing that the security code on back of card was wrong. I have had this card for years and it has always worked fine in the store. This was my first time using it online. I called and after talking with a woman service rep and she putting me on hold FOREVER...more then 15 minutes... she finally came back on and said she'd issue a new card but that I could use my original card in the store until the new one came in mail. I assumed she was sending a card with a new # and new security code. That same day I went to our local Lowes in Kentwood Mi and placed my order for the flooring there. My card worked just fine at the store. Today I received the new cards and THEY HAVE MY SAME OLD # AND SAME OLD SECURITY # ON THE BACK.....WTF. This was a complete waste of my time. SOOOO... once again I called and todays person tells me that OH NO...a brand new # with different security code has to be issued and my old # has to be cancelled with no card available for 7 to 10 days. You need a lot better training so VALUED customers don't need to waste their time in this fashion. I have more building products that I need to order this week but since at the moment I dont have a working Lowes card I will be forced to purchase elsewhere. Nice way to treat someone who has been a Lowes customer since you started in Grand Rapids mi. Bought Troybilt mower 6/31/18. Checked oil started and cut lawn. Next time I went to use it died after one pass. Checked oil ok Wouldn't restart felt like had no compression. Took it to Lowes and was sent out for service . Connecting rod broken due to lack of lubricant. Well ok thats a cause of broken connnecting rod but in this case I had checked oil on two occasions and whoever diagnosed it took the easy conclusion and sent it back unrepaired. I realize you have policies but in this case you are losing a customer for life and your reputation will be sullied by everyone I speak to about this. If you had sent it to someone more reputable they might have noted that the mower did in fact have oil in it, it was only 6 weeks old and maybe there is another cause for the connecting rod issue. Anyway that is enough for me to hold a lifetime grudge against Lowes as well as Troybilt. Thanks for listening and I expect I'll see you in heaven. WITHOUT NOTIFYING ME. I AM HOME ANTICIPATING THE SERVICE AND THEY DO NOT SHOW UP THIS HAS GONE ON TWO TIMES, NO PHONE CALL OF RE-SCHEDULING. WHILE I WRINGING OUT MY CLOTHING IN MY BATHROOM.... SERVIOUSLY. CALL LOWES CORPORATE THEY JUST TAKE INFORMATION... DOES THE CEO WRING HIS CLOTHES OUT IN HIS BATHTUB AND WAIT FOR SEERVICE TIME AFTER TIME?????????????? I AM NOT A HOUSEWIFE,THAT HAS TIME TO SPEND WAITING. I HAVE A CAREER HOW DARE YOU LOWES PUSHING A SERVICE YOU CANNOT PROVIDE IN A COUTEOUS TIMELY MANNER. On June 28, 2018, I purchased $12,211.48 appliances and services from you. So far I have only the carpet installed I have tried numerous times calling my production person with not one phone call returned. Finally I called customer service and they did final a complaint with the store I purchased everything from. Finally I got a call from the production person stating appliances and material will be delivered the 15 of August with installation slated for the 20th two months after order was placed and paid for. In the meantime, I have no stove, refrigerator, dishwasher, microwave etc. since I moved into recently purchase home Needless to say I am very dissatisfied with your service I will say I believe your production person is responsible for dropping the ball but thats no excuse. I would appreciate anything you can do. Hopefully I will get a answer soon. Lowes offers price match and lowest price, however their carpet Subtle Beauty III is the exact same carpet and manufacturer as what stainmaster calls Refined Vision III. This is a total scam that LOWES has their own name for the same exact carpet because they use it as loophole to get out of price match. I proved it is the same carpet and yet they say well the name isn't the same so we cannot match it even though I contacted the manufacturer and they said it is all the same and NOTHING is different other than they have different name for the carpet for lowes. DECEPTIVE and WRONG. BOOO to LOWES and their FRAUD in advertising. Ordered four appliances on 7/10/18 and asked for delivery on 8/7/18, almost a month later. On 7/31/18 I was informed that my order would not be filled until 9/4/18. I called and asked to move the delivery date to 8/3/18 and that is when I found there was a problem. My kitchen has been torn apart and old appliances removed and some given away in prep for the new units which are now not going to be delivered as requested. I would give a zero star but the system will not allow me to. Today at 8 am I bought material for a job using white vinyl railing. After reaching job site I discovered that 3 packs of the end connectors had been opened and three different types of connectors were in the bag. I also bought an eight feet long rail kit, but was unable to use. The plastic wrapper was almost torn off. I returned this rail kit to the store at lunch time. I gave Jennifer my receipt and she promptly asked, "are there any parts inside". I answered that all parts are there. She gave me a smirk and said since I opened it she would have to call the lumber desk and get someone to "ok" that everything was there. Approximately ten minutes later Joey arrives and looks at the wrapper on the kit. He doesn't know so he proceeds to call someone else. After ten more minutes she does the return transaction. I say all that to complain about how cold I treated and how unprofessional both were. I am purchasing materials every week for various jobs and spend upwards of $100,000 each year. I have been using this Hamilton store since it opened and have never been treated in this manner. I hope you address this poor service and call me to discuss as soon as possible. I have always received good service and everyone is helpful until today. The best service and help comes from Janet at the Commercial desk. I’ve been buying material from Lowe’s for decades and never been dissatisfied with them. We recently had a complete roofing job on our house performed by a Lowe’s contractor and it was absolutely terrible. The roofing job was done poorly. There was damage to siding. They literally threw the satellite dish off the roof destroying it. There were nails left all over the yard and our neighbors yard. I had to buy a magnet and have cleaned up hundreds of nails. Lowes contracting manager came out and took a look at it, but she admitted she knew nothing about roofing. We asked that their roofing expert come out and take a look at it and he never showed up. The contractor refused to acknowledge that any of the damage to the house was his fault and that he had done as good a job as he could. We have vinyl siding on the house and he attempted to repair some of the vinyl siding by driving nails through the face of the vinyl siding, thereby ruining the siding. I hired a certified home Inspector to do an inspection and he agreed that the roofing was poorly done and that the damage was unacceptable. I told Lowe’s contractor manager that I would accept them repairing the damaged siding, but I have received no response. I will never use Lowe’s again. On July 9th 2018 I purchased a toilet and paid for an installation. I had to call the local store Parker Co Lowes to reschedule the installation due to a death in the family. Upon calling the store I was transferred more that 5 TIMES, and never reached the correct person. I hung up and called back a few minutes later, asking to speak with the store manager. He was finally located (took about 5 minutes on hold) and he finally found the person that was to install the toilet. A new date and time was scheduled for July 30th at 2 PM. On July 30th at 2:15 I called the Parker Lowes store and again, to ask about the install due to the fact that the installer was late and I had not received a call to let me know why. I was transferred 3 or 4 times and finally reached someone that said that I did Not have any installation scheduled for today. I insisted that I had and was placed on hold AGAIN. They finally came back on the line and stated that they had called the person that was to install the toilet, and he was responding to the store to pick it up and come to my house to install the unit. Also on July 9th I paid for someone to come to my home and measure my windows for Garber Blinds. That was completed on the 17th and the gentleman gave me paperwork, stating that someone from Lowes would call me to set up an appointment to get the blinds ordered. I finally received a phone message on July 26th, stating that the person I needed to talk to would not be in the store until Monday July 30th. When I called the store today to ask if I could come in and order the blinds, the person stated that she was busy with lunch, and an appointment from 5PM to 7:30PM today, but she would be in the store tomorrow at 10AM. My opinion of the operation of the Parker Lowes store is very low. No one in the store has any telephone skills, the calls keep being passed around until the customer gets frustrated and hangs up...The "HOLD" music is terrible. After my experience with the telephone circus and the unavailability of anyone to order blinds, I think I might order the $2000.00 worth of blinds somewhere else. My husband and I started the process on installing new flooring in our kitchen. We work with a gentleman for and hour at the beginning of July. He past us on to Mick in flooring at the Lowes in Clarksburg WV. He set up out apt for the estimator came to measure he came on 7.12.18. Both sales men told us about the installation special for flooring going on the month of July. We had pick out SMARTCORE Ultra 8-Piece 5.91-in x 48.03-in Woodford Oak Locking Luxury Commercial/Residential Vinyl Plank. Thinking that this would be cover under the special for installation. I wait ed over a week before I called to check on the estimate because no one had called me. I was looking at your website and it also, says Lowes will call to let you know when to come in and complete the process. At the time we were told that there was an installation special going on for the month of July. We I spoke to Mick on 7.26.18 he inform me that the special was over and it wasn't on the product we had pick out. Plus the special was over 7.20.18. This was the day he said that the estimate had been turn in, If we had know we would have sent that day to pay for the product and installation. But, again no one call us. Come to find out that the flooring we pick out was even what the installation special was on. Need less to say we both were very disappointed. I spoke to a manage to no avail. He really did give us any consolation as to why we were given the wrong information. I told him that Lowes offer very poor customer service. I know that my sale will not effect the profit of this large company. But, I thought you should know that your employees need to be better trained. I have saved for this flooring for 2yrs and after the price of the installation and flooring which equal about the same price 2200.00 I will have to continue to save. But, I will going going elsewhere for my business. To a company that cares about there customers enough to give them correct information on the product they sell. My husband and I went to Lowes on College Road in Wilmington NC today to purchase material to build a large deck on our home, so it was a large quantity of boards we were needing. We are in our 60's and my husband is actually disabled, so I asked the employee named Adam in lumber dept. for help. He helped load 4 boards but left when I asked him to help load the 60 some other boards we were needing without any explanation. So I rounded him up again and told him we still needed assistance but he totally ignored me again. I finally found someone else to help us. Needless to say I was very upset with the way Adam treated us. We actually started to just leave and go to Home Depot. My order was made through Lowe’s website (screenshot attached). I placed the order in good faith that Lowes would stand by the terms of ofer which includes shipping. I placed the order July 17. July 19 I was informed the order was delayed. I had no other information provided until I emailed Lowes requesting a status update on July 24. July 25 I was informed the order was cancelled due to “shipping issues”. This is totally unacceptable and wonder if not false advertising. Mr Jerry Hoffman Assistant Store Manager for store0657 sent an email July 28 stating they couldn't ship parcels to Wyoming. Lowe's offered the item and shipping method. Fulfill the order. lowe's in Union City Tennessee is the worse experience I have ever had with a Company! We paid over $4,000 for a tub and surround, over a month and a half, nothing has been completed. The people in the store do not care about much of anything. They keep sending me to someone else - I have talked to at least 7 people, and can't get any answers from anyone. I have documented all the problems in emails to Lowes, and called the District Manager with my complaints, but no one has called me - they just give me someone else's name and phone number. At this point, I'm talking directly to the contactors they hired, since I can't get Lowe's to fix any of the problems we have had for over a month and a half. We were promised a two day installation! UGH! I could have hired a handyman to finish this, without the excruciating pain of trying to get answers from Lowes. I'm at a point now that I'm talking directly to the contractor's they hired. Bottom line: DO NOT HIRE LOWES IN UNION CITY TENNESSEE TO DO ANY HOME IMPROVMENT INSTALLATIONS! SAVE YOUR MONEY AND HIRE A LOCAL PERSON TO DO IT FOR YOU! My husband and I were in store no. 2478 Kathleen, Ga. We stopped there to get a swivel ball attachment for our shower. Once we got to the right department we asked a store employee named Jim where we could find it. He said he didn't know and that it may be on the next aisle over. End of discussion. Didn't bother to even try to help us. We went to customer service and explained to them what had just transpired. Shanitra was very kind and helpful to work on resolving this issue. Another employee Brittany who was a section manager but not sure which section went out of her way to look up what we needed and went and got it for us. She also said that Jim has be reprimanded for this other times and yet he still gets by with it. I don't want to see anyone lose their job but some of these people have be held more responsible for their actions and behavior toward customers. I commend Brittany and Shanitra for their professionalism and kindness. They are an asset to that store. On July 25, 2018 around 5:30 p.m. my husband and children were at the Lowes Store on Erie Blvd in Rome, NY and while shopping and looking at an item a loose pallet fell from a higher shelf and struck my husband in the top right portion of his forehead causing immediate bleeding and a bump. An employee was summoned by my husband regarding the incident who was just like sorry and did nothing to help. My husband asked for a paper towel to put over his wound and was not given one. This employee in my opinion was a disgrace to the company and the unsecure pallet is just negligent behavior on the part of the person who put it on the shelf without insuring the it was secure!! We have had several issues with a recent order from your store. The order number is 352514644 this order is in my wife's name Gail Pursel. First off we had problems with getting the delivery here, I had to call customer support and get their help. This should be noted somewhere on our account. When the order did finally get here one bag of cement was ripped and the 2x4's were the worst I have ever seen. They actually still had the bark on them. I have included some pictures of the wood. The big question that I have is we ordered these products from your Bloomsburg store and for some reason they shipped it from your Selinsgrove store. I ordered it from Bloomsburg for a very good reason. I do not like to do business with the Selinsgrove store it is all around not a very good store not very helpful and bad products. This was totally unsatisfactory and unacceptable. In the future I will not order anything from Lowe's if it will be shipped from the Selinsgrove store. The cowardly, unprincipled management of Lowes allows selfish individuals to park in what is clearly a no parking zone. Those parking like that are too lazy to park like the rest of us and it is a hazard. it obstructs visibility for drivers going through the parking area. (This is the east side of the building, in case anyone from Lowes reads this---which I doubt). What about decency, concern for the safety of patrons of the store, and taking a leadership role and doing what is right? Lowe's installed a new door recently, but a 3"X2" section of the door was not stained. Contact with the local Concord store attempting to send stain to my home and attempts by myself with the manufacturer is bot getting results. The Install Manager in Concord is also not getting any cooperation from the manufacturer . Maybe we have to install a new door. SENIORS COMPLAINT. ONE AILING SENIOR. I purchased and had a washer and dryer installed by Lowes. It was just discovered by SEARS Air Duct Cleaning on Friday, July 20, 2018 that the dryer was not connected to the outside vent (creating a possible fire hazard). I reported this finding to Lowes on Monday, July 23, 2018 and there has been no follow-up. The dryer works and this complaint is not about dryer but the hazardous improper installation/connection As seniors, we did not realize that the missed installation to the outside vent prevented the proper drying. WE THOUGHT WE HAD RECEIVED A LEMON. To dry, clothes requires 3 and 4 drying cycles to get slightly damp clothes. SEARS DISCOVERED ON JULY 20, 2018 THAT THE DRYER AT 21325 FLATWOOD PLACE, STERLING, VA 20164 WAS NOT PROPERLY INSTALLED AND CONNECTED. THE DRYER WAS PURCHASED AND INSTALLED BY THE LOWES STORE. Waited two weeks to get an installation date for carpeting.It is a rental unit and I explained ths critical. Now it will be 9 more days to get installed. This delay will cost me at least the month of August at $1650.00 monthly. Very disappointed in service ! For almost a year I would use my business card to purchase materials. When I would return an item the system could not find my card info if I didn't have the receipt with me. They suggested I get there myLowes card. That's even a bigger joke. Sometimes when I use it the system will recognize it and other times it says the card doesn't exist. It's an absolute joke. It's been so frustrating I have decide to either shop with someone else at the other end of town when I'm working there or shop strictly at Home Depot. At least I never have a problem with a return. I will never set foot in another lowe's. Citrus heights CA Store. Bathroom counters ordered and installed. Counters cut too short. Deliveries not timely on more than one occasion with no calls from store. The worst customer service ever! Waiting for two bathrooms to be redone, counters removed again and correct sizes reinstalled. This is ridiculous...over two months delayed. I bought manufactured quartz and spend a great deal of $$$ with your business. I expect compensation for the difficulty I have experienced over the last two months. I purchased a Husqvana Zero Turn Mower from Lowes on Hwy 18 in Jackson, Mississippi. I bought the unit in 2016. When the mower was delivered, I was excited, tried to start the unit immediately after unloading it off the truck. The mower would not crank. I reported the issue to Lowes; they picked the mower up, serviced it, at least that is what they told me. They returned the mower to me. I used it one time tried to start the mower. The battery was dead. Lowes gave me a replacement battery. The mower still would not crank. Lowes referred me to a local repair shop-Revel Ace Hardware in Byram, MS. They told me, it needed a selenoid switch, what? I just purchased this mower. They said it would take quite a while to get this part, and it did. They picked the mower up in April 2018, it is now mid- July 2018. Oh yes, the selenoid switch came in, they attempted to fix the mower, but it didn't fix the issue. They said they would have to order another part and as soon as it arrives they would get in touch. In other words, don't call us, we'll call you. The State of Mississippi has "lemon laws" and I am seeking a refund on this lawn mower because it has been in-shop for repairs more than it has been on my porperty in my back yard. Lowes store in Mississippi has been indignant and refuse to accept any responsibility for the lemon mower. The store Manager avows that this is between the manufacturer and me, but I am in disagreement. Lowes is a party to this contract, and if they want to maintain a respected reputation in the community; they should live up to their responsibility. I trusted that I was purchasing a reliable machine from a reputable outlet chain; however, my experience has been one great big nightmare. I trust that lowes will honor its responsiblity and refund or replace the unit with a "new" mower, not a refurbished, recondition mower with a jacked-up price because that is what I feel I got out of the deal. Lowes must do right by it's customer or they will likely have a very short, uncertain future- just like Sears, an organization that has a history of mistreating and duping customers. This practice has pretty much put them completely out of business. I trust that Lowes will do the right thing. I am writing to let you know about the poor customer service I received. On July 1st I ordered a dishwasher, refrigerator, washer and dryer and a range totalling approx. $4500.00. Not a lot for some people but for us it is. There was some mix up with the delivery dates and was decided to bring them on the 22nd of July. they showed up on the 18th and call later to inform me that they were there and I wasn't. I then learn that some of the items would be coming from Lewisburg and some from Beckley. On the 22nd I got a delivery of the range and dishwasher. We asked the delivery man and he said "not today" in broken english. I then called to find out the problem and was told that "Sterling" was down and they didn't know who was supposed to get what delivered. The girl at Lewisburg was very nice and assured me someone would call me the following day. This did not happen. I called back and the person said the refrigerator was not there and MAY be in on the truck Friday, the 27th. The third time I called Beckley and asked the question the girl said the problem was "Sterling" and that someone would call me when they got it all sorted and she hung up on me. I have worked in retail my entire life and I find this very upsetting and totally unacceptable as I am sure you do, or should. I am trying to be understanding but there is NO excuse for rudeness. Your mistake not mine. I have spent $20000.00 with Lowes in the last 6 months but will certainly think hard before making any further purchases with you. I have attached a email I sent to Ben in the Augusta, Ga Store on Friday 20 July, 2018 which pretty much spells out our situation. We have yet to get any response from Lowes via any means of communication to this situation. We need to find out where we stand, so can someone please call us (706) 799-1567 so we can resolve this issue. We’ve tried numerous times to speak with you or someone in reference to the fence that we received. Although we feel we specifically order a 6’ spike top Providence fence with a 6X12’ Gate to replace the 5’ fence and 5X8’ gate we presently have, we unfortunately signed a contract not verifying it indicating that we order a 5’ fence. Our situation now is that we received the right gate and the wrong panels, of course which are not installed 1) because they don’t match 2) the hardware received was incomplete 3) no concrete for installation was received. This material was received July 6, 2018 for a fence that was supposed to have been ordered and installed by March 1. We have tried to be patience with the process but it seems that Lowes is unable or unwilling to assist us in rectifying this problem. What we would like is for Lowes to at least pick-up and credit back the 5X6’ panels and line post so that we can move forward with our project by getting what we need from another source. So we would sincerely appreciate it if you or someone would at least call us back to discuss this with us. Plus hundreds more on odds and ends. Please get our kitchen installed. Thank you. Ms. Chapman should have pictures of the installing that had to be repaired. I do not have them on this computer to include but can mail them to you. It is unfortunately that I have to write this email. I love Lowe’s and have spent countless thousands of dollars with you and choose Lowe’s over Home Depot 9 out of 10 time generally. I was in your Edmond Oklahoma store at Covell and Kelly today 7/21/18 at about 5pm. I must tell you the young lady who checked me out was extremely rude. I have never logged a complaint with you before as my experience has always been very good. You generally have excessively outgoing and friendly people. I did not get her name as she was not wearing a name tag, but she had a black Rottweiler service dog with her. With this new face in my neighborhood Lowe’s I will be going to Home Dept at least half of the time in the future. In the event that this young lady is there when I do go to Lowe’s I will walk straight out the door and go to Home Depot. Just thought you should know. As a business owner myself I would certainly appreciate knowing. I'd like to start out by saying you need to eliminate your slogan because it does not represent ANY division within the company. I placed an order online on 07/14. Was told my delivery date was 07/17. At the end of that day received a phone call stating there was an issue with delivery but would be delivered the following day 07/18. On 07/19 was told my order was delivered, as I was currently at my house I explained that it was not. The person on the phone then got extremely ignorant and said they'd look into it and call me back. The next day I called to check on the order since I never received a call back and they told me it was on the truck the day before and they don't know why it wasn't delivered. That person then told me the order is still on the truck and they would ask the driver when he returns at 12pm why it wasn't delivered. This time I did receive a return call at 12:30pm for him to tell me the order is still on the truck and he still doesn't know why it wasn't delivered as the driver left. Why my order couldn't have been delivered that day is a mystery. Either way he assured me it was going to be delivered 07/21 between the hours of 11:30am and 1:30pm. At 2:30pm on 07/21 I again called Customer Care which the first person acted like he was doing something to help but then put me on hold for 5 minutes for another person to pick up. That person said she called the driver(I believe that was complete BS) and said the driver was on his way to the store to pick up the order. Now this completely contradicts what I've been told for the past 3 days. She then begins to tell me for any other help on the matter or for answers about compensation for this issue I must speak with the store directly(more bs). I asked to be transferred to the store where the person working the service desk tried to help me but was unable to. That's when she transferred me to the delivery dept. but instead was placed onto a survey! It is now 3pm on 07/21, I have no answers, no clue where my order is and at this point want to close all my accounts personal and business with Lowes. This has been the worst experience I've ever had! And if I was able to take the lone star off the rating I would and make it a negative rating. So very upset, purchase a gas stove and refrigerator on July 8th, deliver July 10th damage the stove, too much to type get more upset it July 19th, still don't have my replacement stove, excuse's and lies!!!!!!!!! I purchased a shadow box fence from my local Lowes (Charlotte, NC) in June 2018. Install date was scheduled for June 29, 2018. Well that day came and went and when I called Lowes I was advised they did not get the order from the "subcontractor" (aka the fence install co) in time and my fence product would not be delivered until Tuesday July the 3rd with the install date of Thursday July 5th. So the fence pieces get delivered on July 3rd. On July 5th the installer are a NO SHOW. I call and was advised there must have been a mix up and the fence installers got an extra day for the 4th of July holiday. Install now gets moved to Friday July 6,2018. Finally the fence crew shows up at 9am works till noon, takes a 2 hour lunch break, returns to my yard at 2pm. We then get a horrible thunder and lightening storm roll in at 4 pm and they leave (the weather is not their fault), the two man crew returns on Saturday at 9am, it is cloudy but not raining, they ring my doorbell at 10:30 am and tell me they are leaving for the day due to bad weather. Not raining, just cloudy out. 2 man crew shows up Sunday at 8:30 am works till 7 pm my fence is still not completed, they come back on Monday at 8:30 am with 3 men. They finally finish the job. I saw a lot of mistakes with the shadow box fence like the space between each picket were "eye balled" instead of being precisely measured and there were large gaps near the posts. I made my concerns to the workers who were more than angry with my non approval of the job. They fixed some of my complaints with haste. Still not satisfied with the install. I call Lowes Customer service and the salesman as well as the owners of the fence install company came out to see the problems. They agreed with ME. Now I have been waiting since July 10 for the fence contractor to come back to me to "fix" the issues. I have been getting the run around about when the issues with my fence will be fixed to my satisfaction. Yet Lowes charged my Lowes credit card and expect payment on time for the cruddy fence install. My next step is to right to Lowes Corporate about this situation to see if getting some higher ups involved will make these people move a little bit faster regarding my issues. as I was asking for manager another customer said to me" you having trouble getting help too"
Good Afternoon = June 24 2018 I purchased a Top Mount Refridgerator/RT18M6213SR/Order-PO #76971662(51 Woodbridge Ctr Dr, Woodbridge NJ Store #1658) - Sales Associate explained 7/12 or 7/14 estimated delivery date to my residence- I called Customer Service 7/9/18 tt a "Foni" representative, told again 7/12 estimated delivery date and will be received 7/14, also if not received 7/12 then possible Sunday, 7/15 delivery date...….7/12 I called Lowes(Woodbridge NJ ), "prompt #5 for Applicance Dept, tt a Lisa, told "Refridgerator will be on Sun, 7/15 nite truck, should receive Mon, 7/16" .your delivery service, XPO Delivery calls my home phone @ 7:11am Saturday 7/14 stating "5p-7p" delivery, my husband gives his cell # for a "30 minute or less" phone call= NO Delivery, NO call from Lowes or XPO Delivery to explain.. Sunday 7/15 around 10:30a I called XPO Delivery..the "phone prompts" when utilized by me eventually "disconnected" my call, Called tt Lisa again in Store 1658- "Vendor excuse".. So much confusion still going on.....XPO Delivery called again Mon 7/16 evening, I put in my cell #- said between 5p-7p Tues 7/17...no call ever received...XPO Delivery Truck Tracker shows the refridgerator DELIVERED 7/18/18 AT 1AM!!! - I went to Store 1658, Terminal 14, Associate "Toni" @ 8:37:29 today 7/18/18 to "complain", computer showed no evidence where product is....I asked and got my credit card refund activated..I;m upset my existing fridge not broke, just old(16 yrs old)making strange noses. I did my part in good faith, truly wished Lowes did their part...very dissatisfied- I;m advising family, friends of this unnecessary experience and I still have no new refridgerator that I paid in full for. Candace Cook-28 York Dr #5A-Edison NJ 08817.
on MAY 25 I PURCHASED OVER $7000 OF APPLIANCES FOR MY CHURCH,APISON UNITED METHODIST, ALL PURCHASES WERE INCLUSIVE OF INSTALLATION. IT TOOK UNTIL EARLY JULY FOR THE STORE TO GET ALL THE APPLIANCES IN STOCK. THEN THE APPLIANCE INSTALLERS,EDWARDS ELECTRIC?, BEGAN WORK ON THURSDAY 7/12, THE JOB WAS TO COVER ANY MODIFICATIONS TO THE SURROUNDING CABINETRY. THE JOB WASN'T COMPLETED THAT DAY AS THEY HAD INDICATED, PROBABLY BECAUSE THEY DIDN'T START UNTIL THAT AFTERNON. GERALD ,INSTALLER, SAID THEY WOULD BE BACK NEXT DAY TO COMPLETE JOB.THEY NIETHER CAME BACK OR CONTACTED ME WITH ANY EXPLANATION. I CALLED THEM ON MON 7/16 AND WITHOUT ANY REASON FOR THE DELAY OR FIRM RETURN DATE. I WAS GIVEN A FLIMSY PROPOSED DATE, TUES OR WED. IT IS NOW TUES AFTERNOON AND I STILL HAVEN'T HEARD FROM THEM. THERE ARE CABINETS AND DRAWERS STILL LAYING IN THE FLOOR, REFRIGERATOR HAS NOT BEEN PUT IN PLACE AND ICE MAKER IS NOT HOOKED UP. I WENT TO LOWE'S TO GET THIS WORK DONE IN ORDER TO AVOID THIS STANDARD CONTRACTOR SLAPSHOD, UNRELIABLE SERVICE.PRIOR TO THIS FIASCO I WAS PASSED AROUND FROM ONE LOWE'S PERSON TO ANOTHER, I THINK ABOUT 8. EACH ONE GAVE ME A VERY SINCERE PLEDGE TO TAKE CARE OF GETTING THE BALL ROLLING. THESE ASSURANCES PROVED TO BE UNTRUE. THEY WOULD PROMISE TO CONTACT ME THE FOLLOWING DAY, NONE OF THEM EVER DID SO. I REGRET THAT I DIDN'T KEEP MORE ACCURATE RECORDS BUT I NEVER THOUGHT THIS JOB WOULD DRAG ON FOR THIS LONG, BE PASSED AROUND, IGNORED AND FINALLY SET UP WITH AN UNRELIABLE INSTALLER. MY CHURCH HAS HAD AN ACCOUNT WITH LOWE''S SINCE 2006, NEEDLESE TO SAY WE WILL BE CANCELING THE ACCOUNT AND RECOMMENDING THAT ANYONE WANTING GOOD SERVICE DO THE SAME. On Tuesday July 17 I attempted to purchase a Samsung 3 pack connect home Wi-Fi system for the advertised price of $99.99. After checking several local stores in my area, and unable to find it, I contacted Lowe's corporate. I spoke with a representative (Sierra) and informed her of my situation. She attempted to locate this item to no avail. I asked if there was something available along the lines of a rain check. She replied no there was nothing she could do. I then stated that the item should not be listed on line (although I realize it was a corporate move to outduel Amazon prime day) if it could not be purchased. Short of her contacting the IT department to remove this listing I was S>O>L>. As a homeowner I have been to Lowe's a lot. Based on this incident I can honestly say that I will no longer be a consumer. Same said for l my children (who each just bought a home) and as many friends and co-workers as I can pass along this to. Extremely disappointed. i ordered a refrigerator.they were supposed to deliver it on 07 17 2018 with a 2 hour delay they called the day before and it changed to a three hour delay.today they called and changed it to a 5 hour delay.they are making me miss an important meeting . it's a shame a big company like this one,can't plan any better than this. I had a new ceramic floor put in back in April and paid 2392.75. As they were installing they said I needed new subfloor on part of the room. They quoted me $3646, which I thought was the total, not an additional. Also how can putting 16 sheets of plywood down cost 1.5 time the cost of the original installation including materials. I have been dealing with several managers on this but they have been blowing me off including Service Pro employees. I need someone to look into this and give me a breakdown on costs for the second charge as I feel I have been double charged. I understand an additional fee but not 1.5 times more. Service Pro made comments that were absolutely false. I need this resolved, it has been dragging on too long. I purchased a washer & dryer from Loew's in Douglasville, GA on 7/6/18. The store was unable to deliver appliances until on 6/16/18, On the morning of 7/16/18, received a call that the driver of the delivery truck was sick, so delivery would not take place. On 7/17/17 @ 0647, I received a call that only the washer would not be delivered because they could not find the dryer, REALLY???!!!. I was then told that dryer would have to located and delivered to the store on 6/18/19, thus the delivery of these appliances will be on Thursday 7/20/18. I understand that the truck driver was sick but the other foolishness is unacceptable. I purchased carpet plus installation on 5-22-18, it is scheduled to be installed on 7-24-18, four weeks is a long time to wait! I inquired about blinds and shutters for the interior of my home remodel project. I paid the $ 35 fee for the measurements to be taken by the installer. I asked about the $ 99 whole house installation special and was informed that since I only had 7 windows that the $ 99 would cover that. honorable presentation and the last minute $ 400 raise in the price and in addition I am now out the $ 35 fee fir the measurement service which was to be credited back when I ordered the shutters. This incident occurred over the last week at the Washington Mo. Lowes Store. The clerk involved was Mary Beth. The installer who took the measurements was Larry. I shopped at Lowe's in Miledgeville, Ga. on 07/07/2018 durning morning hours in several departments. Very few employees were noted, customers wandering around looking for help, as I was, but what few employees were available were all busy while customers were standing in line at some desks in different departments. Then I get to the checkout area and again there is long lines with only 2 cash registers open, plus return desk was staff. We need more train staff on the weekends, esp. on Saturdays. I purchased a LG kitchen appliance package 7/5/2018. Delivery was late but I was not notified until I called the store 0594. Two of the four were delivered. It was the wrong brand and the refrigerator had a dent on the front door. I immediately went to the store after refusing delivery. The manager agreed the incorrect code was entered and offered to try and replace with what was left in inventory. 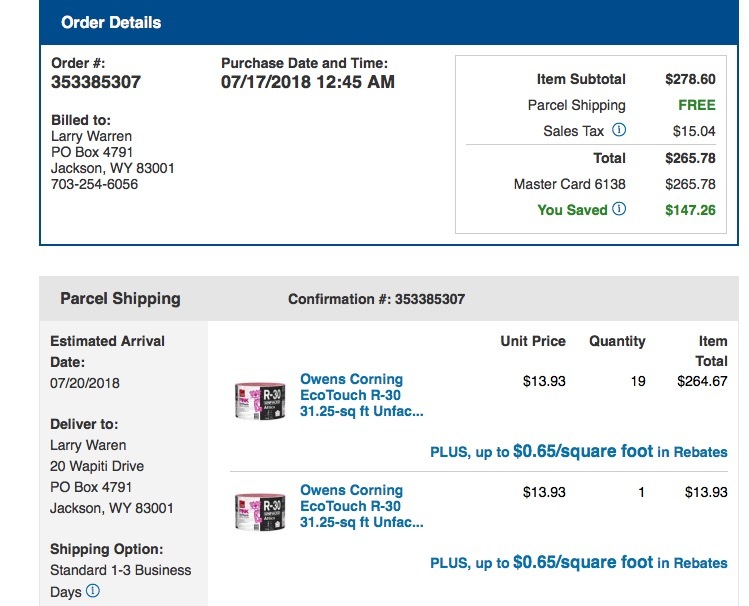 I was okay with this until he said I would have to pay for the second package and I would not receive the $2445.61.00 until the second package was delivered. I had no confidence after not being notified delivery would be late and I did not want $5000.00 from my budget. I am 73 and receive Social Security. I asked the manager to call the driver and confirm I refused delivery. I asked for a refund of the $2500.00 and left the store. I buy all of my appliances and lawn mowers from Lowes but never again. I think I should receive the LG set for my receipt amount of $2445.61 but the sale is over. I am very disappointed and not satisfied at all with the store. Is there anything the store can do to assist me with this problem? In March of this year, I contacted Lowe's about remodeling my bathroom. I also met with Matt Tremblay and the contractor. On April 18, 2018, I went to Lowe's, picked out a new bathtub and surround and a new toilet. Later that month, I called the 1-800 number for Lowes and found out that my order was going to arrive on May 25. I text Matt Tremblay to find out why it was taking so long. On May 2, Matt told me that the new tub and walls should be at their store but the toilet should be here next week. I text Matt on May 10 and May 11 inquiring when the beginning date of the remodel would be. He responded to me on May 11 and advised me he was attempting to track down my toilet that he had called the vendor to see what the holdup was. I text Matt on Friday, May 18 and Monday, May 22 inquiring about my toilet. He responded to me that he was trying to find a different toilet and material shortage was causing a major delay. And it would be July before I could receive it. I did not want to wait until July so I asked Matt if the toilet I picked out was not available. He replied no maam not in bone. I couldn't figure out why Matt waited a month to tell me. He advised he had found some other brands and was checking to make sure it fit. To keep this a little shorter, I never received that toilet or any other toilet he found, went to Lowe's and picked another toilet out - came in too long - and he had the measurements. Had to pick another toilet (I really wanted the first toilet but since Lowe's couldn't provide me something they had on the shelf had to settle for something else (less money for Lowe's). There were other issues with my getting the money reimbursed for the difference in toilets. It seems that I was just dragged along and not told the truth about some things. I talked with CeCe at Lowe's and she was very helpful. I requested a meeting with the manager and Matt and CeCe (she is over Matt). That was on Monday, July 9, 2018. She called me back that date and scheduled the meeting with everyone on July 11, 2018 at 10:30 a.m. I went to Lowe's at 10:30. CeCe and Matt came for the meeting. CeCe told me that some corporate men had came in and the manager would be here in a minute. I was there for 30 minutes and the manager never showed up. Never called me, NOTHING. Evidently, David Smith, Manager of the Ardmore Lowe's, doesn't care about his customers and if they are having trouble. Well, it is July and I am just now getting the bathroom remodel. There are so many other events that happened but it is too long to tell. I would like something done about the manager and how long it took to get my remodel done. Matt Tremblay gave me excuse after excuse and the manager doesn't even care. By the way, I spent over $5,000.00 at Lowe's - which will never happen again. At 11:40 A.M. on July 12 - one day after meeting and after I told CeCe I was filing a complaint, the Assistant Manager called me wanting to know what he could do. I told him nothing - it was too late. He apologized for not making the meeting. I told him that it could have been rescheduled but they just decided now to show up. And to top it all off, they are working on my bathroom and the surround piece is broken - just now finding that outl So, now I will have to wait for another piece to come in before I can get the bathroom finished. Lowe's tells me that it will be at least another 2 month before I can get another piece. I will never deal with Lowe's again. I went into Lowes store #2698 to purchase a washer and dryer on 7/11/2018 at 8:10 pm. I decided on the Samsung top loader and dryer on sale for $549 each. Ricky a sales rep was working with another customer and a young lady assisted me. This lady informed me that the sale was going off at midnight and I needed to purchase now. She later provided me with a note book piece of paper showing the item number, sale price, regular price and the 3 & 5 year protection plan and prices. The sales rep stated that I could go online to purchase this item until 11:59 on 7/11/2018. I left the store at 8:48 pm and the Franklin store closes at 9:00 pm. I went home and attempted to purchase the item on line however, the price showed $599.00 and not $549.00. Today, 7/12/2018 I contacted the Franklin store and spoke with John who pretty much indicated the sale ended when the store close and that is why the price was different. My reply was why is the price different online now (7/12/2018) from what it was last night at 9:17 pm. The online price is now $809.00. I requested to speak with a store manager. Bobby came on the phone and stated that I should have purchased the washer and he could have done a price refund or gotten an estimate which he would have had to honor. Bobby also stated that it is not the store rep's responsibility to give me an estimate without me asking for it. My concern is, I'm not a Lowe's employee and why didn't your store representative inform me of a price estimate that would have been honored for 30 days instead of writing information down on a piece of paper. Secondly, is it not a priority of Lowe's to provide good customer service. I shared the reason for not purchasing in the store I needed to get my credit card. Thirdly, this rep was informed that I wanted this to be delivered on Friday to which she replied any purchase made before 4:00 pm would guarantee next day delivery. That information alone would prompt her to give me a price estimate to return the next day. Basically, Bobby indicated that it is my fault because I didn't purchase the washer and dryer at the higher price to which he could have adjusted. Now the sale is off and there is nothing he can do. If this is how Lowe's practice I don't think I will be purchasing anything else from you. I want a washer and dryer at the price I was quoted in the store on last night at $549 each plus the 3 year protection plan for each. Can someone help me. Lastly, I have an online conversation with a Lowe's rep indicating there was a price glitch with the website. As I stated previously, how do I suppose to know it was a glitch. I feel as though Lowe's dropped the ball. I work hard for my money and to pay extra for something and banking on the store to reimbursement is not right. But, this is what Bobby suggested that I should have done. My complaint is in regards to work we wanted to have done that was left off our contract which is presently being fulfilled. We scheduled hardwood floors to be installed throughout our home with the exception of the Kitchen and bathrooms, all of which have tile floors. We recently had to bathrooms completely gutted and redone and another bath with the 3/4 of the bathroom being redone, all the work was exceptional. The hardwood floor installation started this past Monday, July 9th and so far is being completed exceptional as well. We've dealt with Lowe's for over 30 years whenever we were in the market for appliances, snowblowers, lawnmowers etc. I have no issues with any of that. My problem is we wanted the baseboard frames(not sure what they are called) all replaced as the hardwood floors were(are) being installed. We spoke to both the contractor and Lowe's home improvement rep(Jim Nagele(recently transferred to Florida Lowe's)). When we paid upfront for the floor installation we inquired about the baseboards and when told they were included in the floor installation contract. Yes, I should have checked the contract but didn't because we trusted that the baseboards were part of the contract. But we are now told they weren't. With each and every room having hardwood installed this is the perfect time to replace the baseboard but that's not happening. Apparently the contractor didn't want to do them although my wife and I wanted them to be? Not sure how our wants as customers are outweighed by what the contractor does or doesn't want to work on. We are extremely happy with all the work previously done by Lowe's but being lied to and trusting that our wishes/wants were to be met with this latest contract not sure we will continue to deal with Lowe's in the future. Very disappointed and disheartened by your employee who had no issues in collecting his commissions off of our contract(s) and then outright misleading us to believe we were going to get what we had requested. Floors should be done by end of week or early next week. Once complete our future home improvements will be with another company. Very very disappointed. My boyfriend & I purchased 4 appliances from your Hatfield, PA store & while we had a good experience w/ the sales person, the decent experience ends there! We're not sure if the FAIL was communication from the Hatfield store setting up & scheduling the delivery & installation w/ the outside contractors or if it was something else, but we were told in the store that all 4 appliances would be delivered on 7/11/18 & installed! Then we get a call from one installer last Fri to tell us that he would be coming on 7/11 to deliver & install JUST the microwave; however he showed up delivering both the dishwasher & the microwave--not a big deal but in the interim, last night on 7/10 my boyfriend called to find out what was going on w/ our delivery/install status since no one seems to know from the store to contractors what's going on. We were told that we would get a call back last night by 9:00p.m. to let us know exactly what was being delivered & installed, but never got that call! This a.m. my boyfriend went to meet the installer & that guy showed up w/ the 2 appliances. Again, not a big deal; actually a nice surprise after all! We then got another call saying that there would be another delivery later today between 2-4 for 1 more appliance; however, we have NO CLUE what appliance that one is! Our bone of contention is that through this whole process from purchase to delivery/install we were told so many conflicting things/dates/times! This is our 1st & LAST time buying appliances from Lowe's!!! Your company's lack of communication & handling of what should be a pretty simple & stream lined process was a NIGHTMARE!!!! Trying to get a hold of anyone in the appliance department of the store to speak to & coordinating the delivery to getting calls from multiple people telling us different things was NOT a good experience whatsoever! My hope is that maybe Lowe's will train its sales people much better in communicating to their customers the exact process after a purchase for delivery & installation. I purchase fencing o n line.The order was cancelled no call no e-mail to tell us it was cancel I called them three days later and found out it was cancel.On -line product is still being advertise .I want to know why is this product marked out of stock.It is still on the web site item no .635562 my order no 352270199.Also would like to know why it takes 10 days to put the money in my account spent a lot of money in lowes I read on line that lowes does not respond to there complaints this could have all been avoided if the put it on the web site so i have to pay the price.I really like lowes to refund my money so I can buy my fencing else where. What is the deal with the Lowes at 2945 New Center Point, Colorado Springs, CO, 80922. Every time I go into the store they are short staffed and the employees that are working are getting their butts kicked due to the lack of employees on the floor. Is the store manager attempting to get a larger bonus by not staffing the floor properly? If that is the reason, someone higher up should should have a little chat with him or just fire him for poor managing and selfish motives. I thought customer service is suppose to be the first priority at Lowes. This change in staffing levels coincided with the new manager at Lowes. Corporate needs to hold him accountable. Hopefully you will look into this matter. Why are dogs allowed in Conway Arkansas lowes? Im not a pet hater or lover, but don't want to shop with dog licking my leg as I walk by. What happens when that construction worker brings his pit bull in and it attacks customer, lawsuit. I tried to purchase a riding lawn mower at the 5570 platt springs road Lexington, sc store today 7/7/18. The sales person could not tell me any information about the mower and said well what do you need to know. I said everything like where does the gas and oil go and she says we know nothing about the mowers we just sell them. She then calls her manager and the manager told her that they could only pull the owners manual and read it with me. I had gone to the other Lowes Lexington, sc earlier and that person was helping someone and I could hear him being very helpful with a customer, he was explaining how the mower worked and where the controls were located, etc. I think the Platt Springs store needs some in house training and especially how to treat a customer. I have gone to two Lowes stores to get a quote on 12 pre hung interior doors and two sets of bifold doors for a project i have ongoing. I didn't have any luck at the Robinson Township store so i moved onto the Carnegie Pa store. Now after a month and many visits to the store for the progress of the quote and still nothing in hand i have given up. We also just open a Lowes credit card but i fell i will take my business elsewhere. I would not even give your rating a one star after this issue. I want to give Lowes my business and It is a shame because i have always rated your stores and products better than home depot. Lowe's has failed to given me $30 credit on my credit card purchase. My 1st buy credit card ( ending # 8629) transaction was from out statement and the payment was shown to my local Lowe's office in Lexington, ky. I have tried twice at my local store. I called one time to customer service on toll free number, someone told me to hold phone for few minutes and then told me she will call me in 24 hours. She has never called me and now the credit for $30 has expired date. Please hap me and call. Me on my phone listed in credit card file. On 5/18/18 we signed and paid for a bathtub tear out and shower install. Our salesperson said it would take about 4 weeks to begin and 3 to 4 weeks to complete. We finally got a date for material delivery (7/6) and our pre-construction meeting (7/9), and this morning received a call from Lowe’s advising me that the 7/9 meeting has been cancelled because the contractor can’t make it, and I will be told when it will be rescheduled. We’re now 7 weeks into an 8 week project with no knowledge of competition date. I reviewed my contract and I know that I have no recourse and Lowe’s and the contractor have all the rights, but I think it’s very unfair to me, as the customer, to have one thing implied and another being factual and wanted to express my dissatisfaction, particularly in view of the the fact that payment in full is required at contract signing. Good morning, Im emailing you due to the huge headache and damage our local Bellefontaine store has caused. The envelope had $1,350. Than after everything had settled with the fridge deliveries I get a knock on the door yesterday and its lowes. They asked what fridge they are picking up?!?! No fridge to pick up. My kitchen floor and trim is destroyed from all this. The managers were very nice and helpful and I hate to cause problems for anyone but at the same time..... Im just done with this! Id like my cc adjusted (not cash) and see what we can do for the damage on my floor and trim. We purchased flooring around May 2017 and recently experienced a leak from our toilet related to the installation. After consulting with two professional plumbers we were informed the wax ring was not replaced when re-installing the toilet. The two plumbers went on to let us know this is standard when replacing a toilet and we paid an additional fee to have this done. When customer service was contacted we were told the local store would provide a resolution to the issue. The local store manager (Hanford store), Garret was incredibly rude and condescending. He did not provide a resolution or even consider one. He let us know that we were outside of our warranty and there is no way to prove the plumber did not replace the wax ring that caused the leak. I then reached out to David from installations and he would not return my call or speak to me. He insisted another staff member, Sam (female) discuss the issue with me and I had to explain the issue to her from the beginning. She was professional but still very dismissive and unfortunately did not provide any resolution either. Whether this becomes a legal matter could have been avoided with better communication and management skills. 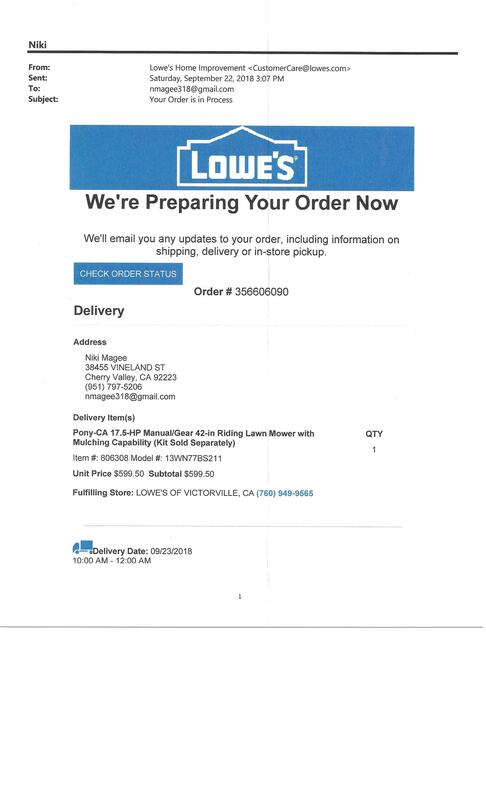 We have done business with other Lowe's stores in Fresno and Clovis CA and have never had such an awful experience. Locally we are not the first customers that have had negative interactions with this man. When customers are avoiding shopping at one location due to the management it should be concerning. I am sure to a company of your maginitude one complaint is not alarming however for corporate to say we should be provided with a resolution and have the local store manager be aggressive and dissmissive was very upsetting. I personally am still hoping for a resolution as this situation has caused not only a major disruption to our home but also the stress level has taken a physical toll. Ordered 3 sets of railings 5 posts and an extra set of in line brackets. Posts came delivered to my house, railings sent to store for pickup, wrong brackets delivered to my house. This was all on the same order. When I called customer service as to why half my order was delivered to the store they had no idea. Now the right brackets have been ordered and are being sent to the store, they cannot ship them to my house, like they shipped the first set. Confused? so am I. Tried calling the main headquarters for Lowe's that was a joke, there's only so much time to wait on hold. I have used internet sales for garden supplies about 4 times. Of all of them only 1 was faster than if I collected the items myself. I am a 72 year old women and hauling bags of fertilizer is not easy. On February 14 I placed an order. The next day the email was there saying it was ready. I went to Customer Service and got my paperwork. The gal at the desk called over to the Garden Dept. to tell them I was coming and that my order was in isle 1. When I got to the Garden Dept. the guy at the register knew nothing about it and received no phone call and worst of all my order was not there. Either someone lied about getting it ready or it was put back on the shelf. The guy at the register calls CC and listens for 5 min on how I need to go over their to get my paperwork all the wild holding it in his hand. He has worked that department for about 2 years and didn't know what the paperwork looked like? No one relayed the message about me coming to pick up my order? I told them I would go the Aldi across the parking lot and expected my order to be ready when I got back. About 30 minutes later I returned and it was ready but then had to wait for someone to load it in my car. All total it took about 1 hour to get my merchandise. This is totally unacceptable. I went to complain the the manager but he was not there. Anyone wanting quick service should stay away from ordering online! Ordered refrigerator, cooktop, wall oven, hood vent, sink, faucet, dishwasher on 1-21-2019. February 4, 2019 Lowe’s called to tell me order was in. Went and picked up hood vent, sink and faucet. Lady got on computer and saw my order and marked onff everything I picked up and verified all my appliances were there. Day after I pick up three of my items, sales lady calls me to make sure I did not get my refrigerator , that it was still there. I said no I have not had Lowe’s deliver it yet. At this point all my appliances were at Lowe’s ready to be delivered. My contractor and I go to Lowe’s to pick up my cooktop February 12 and made arrangements to have my appliances delivered Monday February 18. Yesterday morning at 7:50 am I received a call saying my appliances were not in and would not be delivered today. Called back they said nothing they could do. Called back again and talked to guy in appliances and he went back and found my wall oven and dishwasher but no refrigerator there ,that sales lady called to verify it was there. My contractor went and picked up my wall oven and dishwasher and they tell him only wall oven was there. My house was ready for all appliances to come yesterday I missed work for this delivery. Very disappointed. I have been lied and I feel like my appliances were taken by someone else since everything was in store and gone on delivery date except wall oven. Very disheartening the way I have been treated and lied to. I placed an on-line order..[because of previous bad experiences trying to get in-store assistance]. I was notified that my order was ready at the "pick up" area. I went to the store to that area.. there was no one there. I pushed the "request for assistance" button. The announcement came out SEVERAL times.. after 20 minutes I asked an employee walking around, if there was NO ONE working in that department, he went over and did a phone page.. I was told to go to customer [lack of] service, where the young man there informed the that.. " Sorry, that's NOT my department." At that point I was so angry I left the store WITHOUT my items. This isn't my first bad experience with your company, but I can assure you, that once I DO get my order.. it will be the LAST. On June 27,2018 I signed a contract with Lowes to install a 6 ft high green vinyl fence along the street in front of my house in Southborough, Massachusetts.. The work was to start on July 20, 2018 and be completed by October 20, 2018. The installation was started by mid July but unfinished because one post was the wrong design. When the crew never returned by mid August, I started calling Lowes and visiting the store in order to get the job finished. Throughout September and October, I continued to contact Lowes but the fence remained unfinished. I live in Florida during the winter. Before leaving for Florida in late October, I secured the uninstalled fence sections in my locked garage. On December 11, 2018 Lowes sent me a bill for $6,793.33, the balance due on the fence less $100. ( total job cost $10,340 - a deposit of $3,446.67 was paid on June 27, 2018). I complained to corporate headquarters and they have told me they will not complete the fence install until I pay $6,793.33 in spite of the fact that they did no finish the fence installation for 5 months before I left for Florida. When the Lowes salesman sold the fence I was told the green color of the fence was permeated throughout the vinyl material. That was a lie because the fence material is white painted green on the finish. I agreed to pay Lowes the balance of the fence job when the installation is completed however, they want to be paid prior to finishing the job. My husband and I ordered carpet from Lowes with free installation, when the installers came to install the carpet in our basement they had the correct carpet but it was the wrong color. So, after the installers left we came to the conclusion that the customer service person who placed the order for us typed in the wrong color. The color swatch that we wanted was located above the color that ended up being ordered. At this point we were slightly annoyed but hey things happen and mistakes get made, no big deal. Today we went into Lowes located in Washington, PA to get everything sorted out and get the correct carpet ordered. Once we got back to the flooring department desk we were approached by a very nice and helpful gentleman who explained that the associate who works in the flooring department wasn't there yet today and that he was just a delivery associate but if he could help us he could (this was at about 10:30am). So, we then explained our situation and he promptly said that he was just going to call a manager for us to speak with because he didn't know how to even begin to help us. At this point we were fine with everything, then after a very lengthy phone call with the manager he got off the phone and said he was looking for someone named Ron and that he would be right back. He came back after a few minutes and explained that he couldn't find Ron and that the associate was coming in in 20 minutes and that we would have to wait for him because the manager didn't want to come help us. We thanked the associate for his help and we just looked at each other in complete shock and disgust. Seriously? The manager couldn't be bothered to come help us fix the situation which was an error on Lowe's part in the first place! My husband is a store manager for a local grocery store chain and could not believe that was the response we got. The manager expected us to wait for 20 minutes for the associate to come in who was working in that department instead of coming right away and helping us out with something they messed up in the first place. Absolutely unacceptable! We went with Lowes because their price was great and they were offering free installation. Lesson learned there. After this problem is fixed we will pay the extra money for a company who can actually help their customers. We weren't even really upset about the mix up because like I said, mistakes happen. We just wanted it fixed and we ended up wasting about 30 minutes waiting for someone to do that. Unbelievable. Me and my husband visited your Lowes store locate at 770 Daniel Ellis Dr James Island SC 29412 Store #0661 on Feb 16, 2019 around 9:30 am. My husband went to the restroom and it was so dirty and smelled so bad that he could not use it. I thought he was over exaggerating so I went in to see. I was astonished at the filth and smell I have used and seen many public restrooms but this was the worst. How can you expect your customers to use this restroom or take their children in there. If the health department done an inspection they would close it down. Pure shame you allow your restrooms to look like this. I just recently purchased 1300.00 dollars worth of vinyl plank flooring and after driving all the way home we found several boxes were so damaged that the flooring was chipped bent or cracked so we couldnt use it some boxes were even taped shut we were unaware because they loaded the boxes for us I really needed the floor done in a short time frame now I have been set back due to having to purchase more flooring. Very upset with how I found things when I went to lay the floor! Remodel on both bathrooms in condo. Starts out great with rep in the store as we think we have someone who is knowledgeable and responsive. That was October 2018... now to February 11, 2019...first bathroom is 70% complete-forgot to order light fixtures, shower door (who would have thought that was a priority!!) and the bathroom cabinet, mirror and a toilet that is installed but with no lid and no water connection. Frequent attempts to get answers and no one calls you back. Oh..you can talk to Kianna in Indiana (or wherever she is). She can single-handedly ruin Lowes! I was offered the chance to have the 2nd bathroom renovated while we wait on the first. Well, that's a marvelous idea! We'll just go outside to go to the bathroom! Lowe's slogan should be "we understand your concerns, but frankly, we don't give a damn. LOUSY place to do business!! I contracted Lowes to install a perimeter fence around my property in February of 2017 and was told I needed to go to the Village of Schaumburg and get a permit and codes to give to the installers which I did, I am now being ticketed by the Village because they are saying Lowes did not do the installation according to code and that I now have to have it corrected, I contacted Lowes and spoke with both Ashlin McFarland and Christian Luis, both product installation specialists??? They made me pay for the parts to have installer come out and fix, Which they did last Tuesday and once again completely ignored the codes WHICH WERE AGAIN GIVEN TO LOWES, when I again contacted Ashlin by email she responded by telling me that if I want to contact a lawyer I should let her know so she can direct me to Lowes legal, I have cancelled 2 projects I was going to have Lowes do at over 25000.00 and will be using another company, extremely poor customer service and treatment to a very loyal Lowes customer. We have spent a great deal of money at Lowes in the last several months, buying carpet and vinyl flooring. The purchasing was easy and the installation went great, we were very happy. We decided to have our garage doors replaced as well. We had our choice of 3 different stores to purchase these at (Lowes, Home Depot, Menards), we choose Lowes because of the previous serves we received. We bought and paid in full two garage doors with installation back in September of 2018. Here we are 5 months later and we still do not have garage doors completely installed. We receive the run around for five months. We didn't start getting concerned until mid November when we hadn't heard from anyone at Lowe's. We stopped into the store a few times to check the progress and was given an apology and promise to find out what the issue was. In December we were told there was a mix up at the factory, they were unsure if we ordered one door or two, yet no one ever called us to verify. We had to initiate this process. January the problem was delivery to the installer. Finally the installer received the delivery and scheduled to come put our doors in. He worked one day on them, did not complete the installation, said he would return the following day to complete but never showed. It took several phone calls for him to finally get back to us on when he would complete the installation. His excuse was his truck broke down. Currently we have two garage doors that we can not use, which makes our garage useless since we can not get into it. In addition we are in the process of trying to sell our house. This is causing a delay in the selling process. It is now February and my doors are still not done. The installers current excuse is he hurt his back. This has been ongoing for five months. I am not impressed with the installation company ( Access Door Systems, Daryl is the installers name). The only actual help we have received was from Chris with AMAR who had made multiple attempts to contact the installer on our behave. I am tired of apologies, I want my doors installed. I have been apologized to for five months yet no one has seemed to do anything to take care of this matter. We will be needing new flooring for our new home when we move, this experience is making me consider another company to do business with. I know I am just one person's business but I deserve to be treated better. I hope that you will see the extreme stress and frustration here and make this right. We ordered a Refrigerator Item# 712177 (Order # 368601964,Invoice # 88755) from your Fayetteville, WV store, and was told our delivery date would be 2/6/19. Someone was to call us the night before to confirm delivery, no one call. When I spoke to someone today I was told the order was cancelled due to not having a refrigerator in stock. NO ONE called us or e-mailed us to tell us this. We have been without a refrigerator mow for four days. My wife disapproves of Lowes due to past experiences purchasing over $10,000 worth of appliances from you. The only reason we turned to you was you could deliver sooner than anyone else. So much for that. I want to know what you are going to do to make this good. My wife went yesterday to get a thumb screw went to the desk to get help 3 times in a 15min period and nobody showed up she got upset and walked out . I went today to return somethings and the lady at the Regester acted as if i was bothering her to have to do the return and she was busy i will give her that about 5 people were walking around acting like they were busy and doing nothing and could not help her or me.So I can understand as to why you are closing a bunch of your stores. If there was a Home Depot closer I would shop there when one of there workers walk buy you they ask if they can help and that is what a costumer based buss. should be doing. 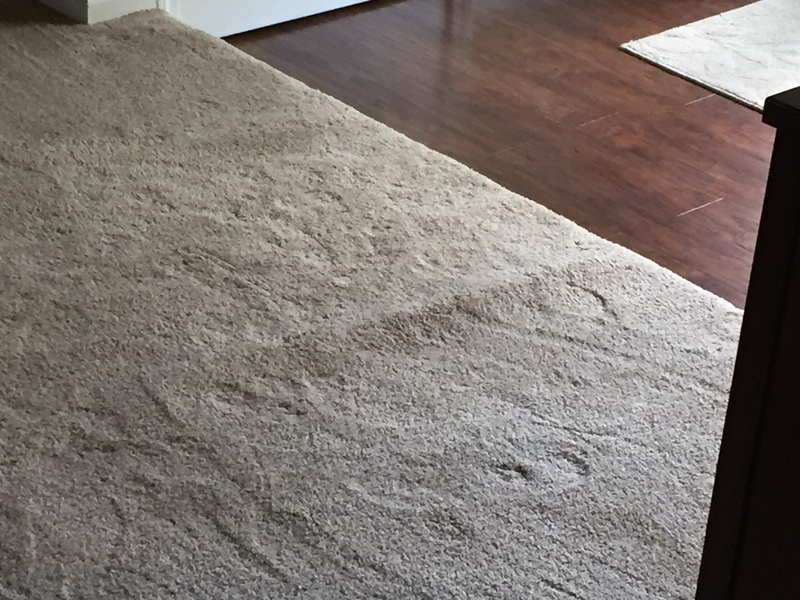 We had new carpets installed on February 2nd, 2019. The installation went smoothly until we found out that the measurements were off by 98 square foot at a cost to us of approximately $441.00. We attempted to contact the installer and measurer that day; nothing. We contacted Lowes, Egg Harbor Twp., nothing. We went to Lowes in person and was told that we were the 4th people that day! TO COMPLAIN OF OVERCHARGING. We were told to call back on Tuesday the 5th as no one could help us. we called a few minutes and no manager was available and were told to call back yet again. We would like to have the credit of $441 immediately. We will have to consider purchasing at Lowes again. We have been faithful customers since 2004 and redid our home inside and out using Lowes. I purchased a dryer, it had a mfg warranty of 12 months. I also bought a 3 year extended claim warranty. Now the unit has gone out in its 3rd year. They will not cover and says their 3 year extended warranty includes the manufacturers. They did not tell me this. Now my unit has broken and they will not cover it. I am done. No more Lowes for me. Currently I have been waiting for over a month for them to complete my kitchen. It has been a very big inconvenience especially having 7 people living in my house. The youngest is two months old! I feel like we have been more than patience with the process and frankly feel like we have been taking advantage. I can not even express my frustration. When will it be done! i called to have my 6 month old stove serviced. I had called due to chips on the cook top. i was told that cosmetic damage would not be covered and i asked who determines if it is cosmetic or not and i was told the service technician would. i asked for clarification that if if it was determined it was cosmetic would I be charged a service fee and I was told no. The service man just left my home and told me it was cosmetic and that I would be charged a service call over $100.00. When I made the service call and asked for clarification, I was told this would not be the case. I was told incorrectly by the service representative and I believe I was on a recorded line and would like someone to listen to the recorded phone call. I can not be held responsible for something I was told. Please call me at 724-265-1441. I put my faith in Lowe's when I bought my appliances and have been a loyal customer and expect Lowes's to correct this error. I do not usually do online ratings but I was not able to access the customer survey. I had THE worse shopping experience at your Aberdeen NC store today. This constructive criticism will probably be dismissed just like my visit at Lowe’s today but here are my comments anyway. I entered the store and asked a gentleman (Ron) in the hardware section if he could help me find staples for a staple gun I had previously bought there. He pointed me at the end of the isle, as I saw him do to the CONTRACTOR before me, who also asked him for help. Please know it was that contractor who actually helped me find the correct staples for my staple gun. You should also know that that patron was unable to locate his needs. He was just as frustrated as I was, so good luck on getting that business back as well….How your staff could blow off a man whose living it is to purchase his supplies in your store is beyond me!! I also needed a chain and another gentleman sitting behind a computer rolled his eyes at me as he pointed me to isle 11!! There were staff all over the store and no one offered assistance. I then went to the blind section where I waited for the sales woman to finish ordering something for another customer already there. I waited, and waited, and not once did she address me and acknowledge my existence even to tell me she would be right with me. I finally left. As I waited in line (note there were only two cashiers checking out a line of customers), four staff members chatted at the door and just stared at us. Again I listened to other customers complaining about your lack of customer service!! You won’t have to worry about any more comments from this buyer. I will most certainly drive out of my way just to go to Ace Hardware where I’ll have everyone in the store asking to help me! This was so frustrating that I discussed it with the manager on duty who just softly said he was sorry. SEE YA Sorry!! I’m headed to Ace Hardware or will order online from Home Depot!! In mid December, we went in to our midtown Lowes and spoke with Rene about carpeting needs. We paid for Lowes to come out and measure so we would know what we were looking at for costs. The fee was $45 which we were told we would get back if we followed through ordering through Lowes. I met the individual (not a Lowes person but a subcontractor) who did the measurement and said he'd have the numbers to Rene in two days. From there, Rene was to contact me right away. We expressed to Rene that this was going in a rental and time was of the essence. He stated that installation was 2 weeks out once we made a decision. Rene never contacted us. It wasn't until January 4th that we got a message from him and that was a voicemail stating he had the information (for some time) and that I was to come in to the store to get it. It wasn't until January 8th that I was able to get a hold of Rene. I asked about the square footage, etc., and what the breakdown was by room (we told him from the start that we wanted the bedrooms separated from the living room/stairs/landing as they weren't in too bad of shape and we may have to keep them as they were. He told me that's not how it worked and that it was all together. Basically, I was crap out of luck. After a lengthy conversation, I asked to speak to his supervisor (it was clear he didn't care). He hemmed and hawed but finally said her name is Vicki. I asked that he have her call me. He claimed she wasn't in the store that day (January 8). It is now January 28, 2019, and there has never been a call, an email, a letter, or anything else from anyone from Lowes, including Rene or Vicki. I am so ticked, I could spit nails. Our project timeline is so messed up that we've lost a month now. That means another month, and in two days, another month with no carpet and no rent money coming in! What a crappy store. Crappy employees. It's clear it was fine for Rene to take our money and expect us to go away. If I could, I'd leave a negative star rating! Went to pick up a kobalt stool. It said it was on isle 59 at the store. There was no isle 59 at the stoor. I looked around unable to find it. Went to customer service. The 2 employees were dicussing what time they get off and talking on their cell phones. Finally they told me it was on isle 17. It was not. No one in the store seemed too urgent about anything. I finally ask if someone could locate this product. The called for mgmt. In total I was at this store an hour to pick up one item. Everyone I spoke to seemed bothered by me trying to locate an item. I never saw employees seem less interested or slow in my life. This may explain why the parking lot was empty at 2:00 in the afternoon. I will never shop here again. Get some mgmt and employees who care. Horrible experience. This was in West palm beach, Fl., on okeechobee blvd. Purchased a extended 5 year protection plan for a dishwasher we bought at Lowes. When we bought this protection plan we were told everything is covered. The tines on the racks are coming thru the plastic covers and scratching my dishes. After reading the protection plan it says normal wear and tear are covered, but when I called the service dept. they now say, we don't cover the racks. What part of "we cover everything" don't I understand? As far as I'm concerned, this is a total rip-off! In the future I will not buy anything from Lowe's again and will express my dissatisfaction to anyone who asks! What I waste of money! It probably cost the same amount to replace the racks, should have said no to the extended plan. On December 21, 2018, I placed an on-line order for a Modular Outdoor Kitchen Center, model 463246418. We have been looking at the local store display model listed for $1199.00 for several months where the store representative informed me the item would have to be ordered as there were none in their store inventory. My wife finally decided to purchase a unit as a Christmas gift for me making an the on-line purchase. We were happy to discover the modular was priced at $899.99 on-line so we made the purchased with delivery. I subsequently received an email stating the delivery would be on Friday, January 18, 2019, between 0800 am - 0800 pm. On Monday, January 14, 2019, I called the Kahului Store where a representative confirmed the item was in stock and delivery to my residence would be on Friday, the 18th. I made myself available on the 18th for the entire day, actually performing outdoor chores at my home as so not to miss the delivery. At about 1 pm there was no delivery so I checked my phone and found I had missed two calls. Both calls had no voice messages I called the number and left a message as no one answered. I then called the Kahului Store where a representative said the delivery was scheduled for the afternoon run, the second delivery for the day. I requested to speak to a manager and was connected to a female supervisor, Unfortunately i did not get her name. She said that due to the size of the item, a flat bed would have to be used to deliver the kitchen modular. The morning run delivery personnel were not back yet after the morning deliveries. I informed the supervisor it would be better customer relations if they could inform their customers about these delivery schedules so their customer wouldn't waste their entire day just waiting around. The supervisor said they are not sure about the deliveries until the morning they arrive for work. I find this highly unusual as deliveries are normally scheduled days in advance and not just that day. The supervisor also mentioned the delivery personnel will call within a 2 hour window of the delivery. Being it was about 1:30 pm. I asked the supervisor I could expect the delivery until sometime after 3 pm which she confirmed. I even joked with my wife that the store would probably make us the last run of the day because I complained. I waited, and waited, and waited - 4 pm, 5 pm, 6 pm, and still no delivery. I also remembered the confirmation delivery email said the hours of delivery was between 8 am - 8 pm. Now it was about 7 pm and getting dark so I called the store and spoke to a supervisor. A male named Kevin said their delivery personnel had called me twice during the morning with no response. The delivery people also drove to my residence and left a note on my door. I told Kevin that I didn't receive any calls from them as there were no messages. I further told Kevin I called the store in the afternoon where a manager said my item would be delivered in the afternoon. I also told him I was home all day where no one came by. My driveway is enclosed by a metal gate with a security camera along with my dog. There was nothing showing a delivery truck stopping at my home recorded on my video camera. My dog wasn't alerted, and no one could have entered my property walking up to my front door and leaving a note. Kevin said he could not do anything to help my situation and the modular kitchen would be deliver next Wednesday, January 23, 2019. I told Kevin that was unacceptable and his explanation made no sense. He said his records show delivery was attempted in the morning but when I called the store at 1:30 pm, another supervisor said it would be delivered in the afternoon second run which never happened. Frustrated as I was, I drove to the Kahului Store on Saturday morning, January 19, 2019, and picked up the Kitchen modular myself. I have always heard horror stories about our local Lowes Store and now I believe them. I will not shop at the Lowes store here unless they are my last resort. Please respond to me with your findings because I truly felt I was not provided the decent customer service. Even though I was able to take advantage of the on-line price I don't feel that should have made any difference in the service I received. I also see the price for the same unit is now $1399.00. Monday and I have heard nothing. I have been washing dishes for two weeks with a new defective dishwasher sitting in my kitchen. The store has no concern for my problem. I hate to complain but this is not good business. In May of 2018 we purchased an HVAC system thru Lowes, they contracted with Willard Heating and Air in Dallas, TX. We have been having issues with the system since installation. Now on the coldest day of the year its not working. Called service, they want to charge 189.00 to come out. It’s not even a year old yet. Willard is terrible and its a shame that Lowes is associated with them. We are now sitting and waiting for someone to come out. So much for spending 15000.00 dollars thinking we would get good service going thru Lowes. I am almost 70 years old and I have a pace maker with a defibrillator and I shop at this location all the time. I went in this morning to buy ten 40 lb bags of pellets and approached an employee named Jeremy, who was talking on his cell phone which sounded like a personal call who wouldn't help me. Another associate (female, texting on her phone) didn't want to help me either. Said she didn't know where they were . I got upset and told both of them I wanted them to load them for me. They both copped an attitude and just threw the bags in my truck and walked off. Where I work, no cell phones are allowed during working hours. The two were extremely rude toward me and as a customer, this is completely not acceptable! They lied to me and told me no pesticides were used on the milkweed. They said they looked so good as they just got them in that day. All 20 of my monarch caterpillars died after crawling on those plants. They fell off into the dirt in the pot. I’m livid!!!!! Sorry but its not a complaint. I want to thank Lowes for saving me 1500$ on custom sliding glass door. We had three subcontract quotes at almost twice the amount we spent having Lowes measure , order and install a 8' sliding glass door. I would give 5 stars but the stores these days have skeleton crews working the stores and I walked out three times waiting for someone to help at the door section of the store. Still it was worth it in the long run. TY again. The refrigerator had an extended warranty purchased when we bought it in Nov. 2014. The refrigerator was delivered on Dec. 3, 2014. The Model no. is: WRB322DMBB00 & the serial no. is: K44014440. We noticed that the refrigerator section wasn't cooling on Jan.7, 2019. My wife contacted our local Lowe's Home Improvement of Morganton, N.C. about it not working. They first said that they couldn't find the purchase record and that they didn't have a repair man to fix appliances. My wife called the next day (Jan. 8) and ask for the Appliance Dept. and they couldn't find the record either of the purchase, but gave her the 1-800 number to Service Center. They then contacted a local appliance repair service center. The service center DID find where we had purchased the refrigerator and the extended warranty. We have had to put all our refrigerator items in ice coolers and keep ice changed periodically so our food wouldn't go bad. It has been a week since the refrigerator stopped working. A service technician came today, but he told my wife that it would be another 24 to 48 hours before he would get an approval to proceed with the repairs. Mean while, we're still having to keep ice on what food we have that hasn't gone to the bad. I just wonder if you (reading this) would be pleased with the slow response to fix your refrigerator should yours stop working and under warranty. I have purchased all kinds of building materials, tools, all kinds of appliances, yard & garden materials, etc. My wife & I are very disappointed in how slow it has been to get anything done on this refrigerator. It is very disheartening when it seems that NO ONE CARES about getting this fixed Quickly. To me this is like having your heat to go out in the dead of winter and you're left setting in the cold. Here again, you can't go to the grocery store to buy the food you would really like to eat because you don't really have a good way to keep it. My wife & I are seriously considering looking else where to buying all items we need for home improvements or other appliances, etc. in the future. We will also be letting others we know about how slow you are to get appliances fixed under your warranties and taking care of your customers. upon purchasing 10.00+ order and requesting 10% discount,being 30% disabled veteran with va card with picture and service connected disability verification was denied a $1.00 discount because my telephone# was not correct, that I have had for thirty years. why with i.d. card in hand must I need to give further information to gain your offer of 10% off, offer. home depot asks no questions upon viewing i.d. this is not the first occurrence this happened. no longer will I shop lowes and I will close my credit account with your company. $1.00 really? I needed to purchase hardy board screws at my local Loews store in Gallatin Tn. First, I decided to check the hardware dept. for about 10 minutes with no luck. I looked around and there were no Loews employees to ask. I then decided to check in the area of the hardy board. Not knowing where the hardy board was located I wandered around some more. Still nobody to ask. I managed to stop a young man employee who walking by and he told me where they were. I needed to purchase a few more things, so then I walked around some more until i eventually stumbled upon what I needed. It seems big box home improvement just hate to hire employees. We the above named couple are coming back to you on the erroneous and false reporting of our credit rating. To begin with about 10-12 years ago we had a Lowes credit card and were trying to trim our budget for retirement so we turned in the credit card. Last month or so we noticed a couple of leaks in our roof and so we called Lowes and a salesman came out and gave us a bid of a little over $17,000.00 to have our roof fixed. So naturally I went to the store I had already bought several thousand dollars’ worth of stuff over the years to get a credit card to help with my repairs. Both I and my wife signed up for one and it was turned down in a matter of minutes and now here a week or so later we finally get a response why. 1. The first is because I am a veteran and I receive 80 % disability for the same and Lowes has put me as a risk of paying back my debt and in the process has lied and assaulted our character. 2. 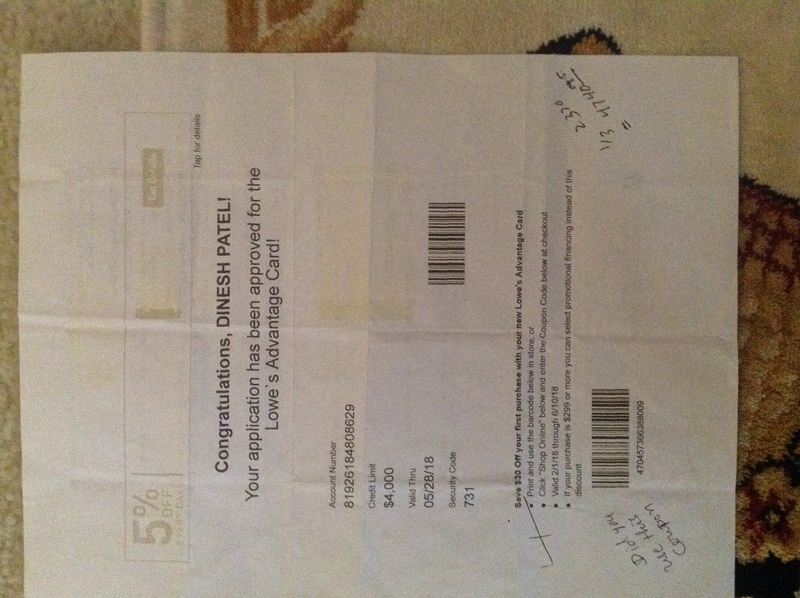 The second is, A few months back we applied for an Amazon card and received one in the mail. The only thing I bought was a hard drive because I didn’t need anything else at the time. But on the first months bill there was a charge for something else. So we called Amazon and they took it off. The very next bill we got and that same charge was on it again. So I decided not to go through that every month so I cancelled the credit card which was issued with Synchrony Bank. They did not want us to get rid of the card and tried to get us to keep it but then I have bought from Amazon for over 15 years so kept the Amazon account but opted to continue as a pay as you go person and it has worked well. However about a year ago I bought a newer car in Columbus Ohio and it was financed with Huntington Bank who said my credit score was well over 700 at the time. Just last month I talked to my banker here in WV and he offered to give me a better rate than Huntington was giving me on my car and I got a rate of 4% which was 2% less and several hundred dollars over the life of the loan. Then last week or so I bought another used car in Marietta Ohio and my banker financed it for the same rate and I have a copy where this same Experian says my credit score dated on 12-21-18 is 757. Also on that same date TransUnion and Equifax reported close or similar scores. But I get this letter where I have applied at Lowes and they say this same Experian is saying my score is 445. I’ll send you a copy that I will present at our time in court if you wish so now then let me know. But to beat all that right after we got that turn down from Lowes we went into Parkersburg WV to the Home Depot there and applied for their card and was immediately approved. What you have done at Lowes is unlawful and illegal and if I don’t receive a response from Lowes to these allegations legal action will follow. I am a disabled American veteran and was happy to go and do my part. I am now 74 years old and have been a Pastor of a church for over 10 years and a member of the DAV. What you are doing defrauding me as you are will not go unnoticed in this world. Maybe you can shed some light to the judge and jury on how our scores dropped that much in that length of time without you using some sort of misaligned prejudices. I respectfully submit this letter before I file legal action to give you time to repent of your evil ways. I will wait for 10 days before I file legal action for you to respond. I bought a new refrigerator 2 weeks ago, and told them exactly the delivery instructions. I planned the date on a Friday when my son would be available, but he was not home when they called. He lives in a house, I live in a mobile home 200 ft from the house. EXACT INSTRUCTIONS! ... when I talked with them upon purchase, and when they called my son.... go straight on the lane to the trailer/deck in the back... unload the refrigerator and take in the back door and set in the kitchen... my son would then place it. THEY DELIVERED THE REFRIGERATOR, LEFT IT ON MY SON'S DECK... OUT IN THE SNOW!... UNATTENDED!.... my son found it several hours later when he got home. He/family moved it to the garage, and I called Lowes the next morning to tell them NO! .. this is unacceptable and will not accept this appliance, to bring me a new one. What kind of delivery person would do this?.... completely unacceptable. The appliances cost enough, and then would be awful to accept one left in the elements due to negligence. This was at Vincennes IN. They shoud be reprimanded or at the very least, given instructions on how to correctly give customer service! Ordered windows at lowes manufacturer is Pella, since the first wk. of December. The delivery date was changed 3 times, and finally delivered to your lowes store January 08th. Spoke with all levels of management during this incident. After crossing this hurdle, Mr. Lucio, a contractor for lowes, was suppose to contact us, to arrange an installation date. "Freddy", in charge of installations for lowes called him numerous times, and finally made contact, informing Freddy that he would call us that same day, Tuesday, which was yesterday. Mr. Lucio, the contractor never made that call to us. I am getting very frustrated at this lack of professionalism, and want some accountability. I made 2 payments when waiting for the merchandise on my lowes card, and am making payments for this contractor to do his job. I am giving lowes one wk., to sort this out before I ask for a full refund. I feel this transaction is being carried out in bad faith. Would give 0 stars if it let me. After making an order online I did the survey. Before the survey I used to never get any soliciting. Since the survey I have gotten 14 phone calls from solicitors. It’s against the law to sell people’s data. Ask Mark Zuckerberg! What your doing is illegal and you should be ashamed of yourselves. After this I’m only shopping at Home Depot and Walmart. I will be following up to make sure your not leaking anybody else’s information as well. I would attach the photo of my phone logs to show you but afraid you will leak my info. I am putting the word out on Twitter and other social media bc this is a big deal.